An isolated ancestral home ruled over by an eccentric patriarch with a keen interest in esoterica and a private museum of medieval weapons, into which an eager young man is brought by an acquaintance only for murder to insinuate its way among the denizens…yup, John Dickson Carr’s The Bowstring Murders (1933) certainly is a classic of the genre. What’s that you say? Death’s Mannikins? Oh, wow, uh, this is awkward. Okay, let’s start again: an isolated ancestral home ruled over by an eccentric patriarch with a keen interest in esoterica and a private museum of medieval weapons, into which an eager young man is brought by an acquaintance only for murder to insinuate its way among the denizens…yeah, no, there’s no getting away from those similarities. And, y’know what? I only bring it up because there’s more than a touch of Carr about this, Afford’s second Jeffery Blackburn novel, and that’s really not a bad thing. It was as though the second tragedy acted as sudden leaping flames under a simmering pot. The scalding, seething flux exploded and boiled over, galvanizing each person under that roof into an insane panic that throbbed and hummed and zoomed from cellar to tower with the horrible impotence of a monstrous and unclean bluebottle trapped against a window. The half-light seemed the enrich the drab colouring of the garden, and it took on an aloof dignity that was very near beauty. The hush of approaching night was omnipresent; even the wind was stilled. Jeffery, pausing to look back at the house, was again conscious of that disturbing suggestion of unreality, of moving in some waking dream where trees walked like men and the dead acquired the gift of tongues. Although it unfortunately becomes less redolent in atmosphere as it progresses, there’s a sense of the macabre and the sinister that pervades certainly the opening stages of Afford’s novel and then resurfaces at intervals later on which is not unlike the master. Indeed, it is frequently the standard of the writing – from reporters chasing threads of a story ‘with all the tireless anticipation of vultures tracking dying cattle’ to the observation that ‘murder is almost invariably the best emetic for bringing up the latent bile of any situation’ – that trumps the uneven unspooling of a plot that just about stays this side of excessively drawn out. Being an earlier book than Owl of Darkness, Blackburn feels less like Afford’s own character here and more a collection of Ellery Queenisms (obscure quotations a speciality) that would be phased out as this short series progressed (Philo Vance gets a name-check, which is another apposite comparison to draw). Det. Insp. William Read could almost double as Queen, Sr., too (even calling Blackburn “son” on several occasions), but then the comparison being hard to escape doesn’t necessarily make it a bad thing. Sure, there’s not the invention of Queen here, nor the plotting or hiding of the guilty party of Carr, but for a second novel to be held favourably with those grand old men of the genre is no small feat. Yes, it comes up short, but in doing so goes a damn sight further than many others who have tried the same thing and fallen harder. 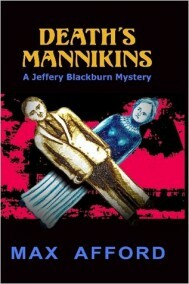 It benefits from unusual structuring – the main murder under discussion is resolved in all but culprit with still 90 or so pages to go – and the fact that Blackburn is undoubtedly more ‘amateur’ than ‘genius’: it’s refreshing to have your independent sleuth frankly admit to their bafflement, and see them put things together by the occasional intuitive leap after a lot of frustrating pacing and self-doubt. Love a genius detective though I do – seriously, there’s a reason Gideon Fell, Sherlock Holmes and their ilk remain popular – a bit of human doubt and confusion is always welcome. If it leads to slightly lumpy plotting and unintriguing stretches of detail-cramming, well, that’s why people typically read a lot of books in a particular genre. If in the long-run this is slightly less successful than Owl of Darkness, it remains nevertheless an enticing read and another reason to check out Max Afford and his contribution to the genre. I submit this review for the Golden Age Vintage Cover Scavenger Hunt at My Reader’s Block under the category Two People. For anyone wanting information about Afford’s other books, TomCat has taken a look at a couple of his impossible crime tales and rather enjoyed them; his thoughts can be found here. All the books of the Blackburn series are now available at Project Gutenberg Australia. Opening of this review makes me wish I had picked this one instead of The Dead Are Blind. I may have to return to Max Afford sooner than anticipated. Thanks for me the mention! And I haven’t forgotten about that blog-post about what constitutes a good impossible crime, but, at the moment, I don’t really have the time or inspiration to pen that post. But I have not forgotten about it. The Queen/Carr comparisons are quite hard to ignore in this…certainly it’s a Minor Carr and a middle-period Queen, but it’s interesting to reflect that these are most likely the influences that got Afford started (or – hey! – maybe it was the other way around). Excellent post as always. Nice way to start a Wednesday and this book does sound quite tempting. Influenced by your blog I have got a Max Afford book in my TBR pile now, called Blood on his Hands. Not quite sure where this book is within the series but I look forward to giving it a go in the coming weeks. I believe Blood on His Hands is the first Blackburn and might even be Afford’s debut. I have The Dead are Blind, which comes after DM, I think, and TomCat review recently (which prompted me to read this next rather than that so we got a bit more coverage…it’s all getting very cosy here, isnt it?). Delighted to hear that I’ve encouraged someone else to take the plunge with Afford, look forward to your thoughts on it when you get there. It’ll be interesting to see what he is like at the start of writing career, since BOHH seems to be his first. Hope it’s a good one. You’ve just about convinced me to give Afford a try. If I can find a copy of DEATH’S MANNIKIN’S for a reasonable price I’ll certainly do so. I have read the first of the series Blood On His Hands. It is quite good and I give it 4 stars. The identity of the murderer was a real surprise to me ! Excellent news! I have The Dead Are Blind and TomCat quite enjoyed that, so it seems that Afford is playing out well. Thanks for letting me now. I have since read Death’s Mannikins and agree with your observations. By the way, did you notice the reference to the 1855 incident of Satan’s hoof-marks in Chapter 10 ? The murderer was obvious to me after the will was read. Also, it is doubtful that the trap for the murderer would have worked. When the murderer is expecting to inherit the entire wealth, it is unbelievable he would go back for a necklace. Haha, yeah, I saw the ‘footprints of Satan’ reference…a bit of a Marvel Universe crossover moment there from Ramble House! I agree about the identity of the killer, too, it is guessable from that point on, but I kinda thought that was the point. Hmmm, it’s so difficult to know when I’m being smart and when authors are making it easy for me…damn them for not still being alive to clear this kind of thing up! I also thought that the author was purposely making it guessable and later he would trick us. In fact, he seemed to do so, but, alas that was not to be ! I have now started the third book of the series The Dead Are Blind. There is an n…..word in Chapter 2 (…our engineers have been working like n****rs….). It has not been deleted from the current edition ! Yeah, Ramble House are great for that – everything is presented as in the original version. They’re doing it right.